The following news article is about the ongoing situatuion in Weld County, Colorado. EcoFlight conducted overflights to asses the condition of some of the wells that were affected by the flooding. The original Al Jazeera article can be viewed by clicking here. Activists say ruptured pipelines, gas leaks and oil spills in flood-stricken Weld county put environment at risk. In Weld County, an area northwest of Denver and Boulder which has seen some of the worst of the rains, activists point to photos of destroyed wells, tanks and pipelines posted on social media sites. They claim years of “fracking” – the process of drilling for shale gas through hydraulic fracturing – has made the area vulnerable to contamination in the event of flooding. "It's the most heavily drilled county in the U.S., and it's seeing some of the worst flooding," he said, adding. "Oil and gas and chemicals associated with drilling are going to be spread across a wide swath of landscape." Renewed fears of pollutants escaping into the environment resulted from the latest floods which began last Wednesday, triggered by unusually heavy late-summer storms that drenched the northeastern part of Colorado. Along with Weld, Boulder, Adams, Jefferson and Larimer have been the worst hit counties. There are hundreds of active oil and gas wells built in the South Platte River flood plains alone that are at risk of contaminating the flood waters. Already, there have been reports of a ruptured natural gas pipeline and overflowing crude oil wells. Schuller also responded to controversial photos Colorado residents have uploaded to social media showing floating tanks, blow-outs and flooded infrastructure. "These containers have pipes attached to them and can hold 5,000 gallons or more," said Wockner. "If the tank is floating and tilted, then the pipes are probably breaking off." Meanwhile, oil and gas companies have been keen to stress the measures they have brought in to make safe their pipes and wells. Colorado Interstate Gas Co., a Kinder Morgan company, declared "force majeure," an event that is the result of elements of nature, on two of their pipelines on Sept. 16 in an online statement. Most industry companies with infrastructure in the affected areas have made statements saying they had "shut in" wells and pipelines before the worst of the flooding began, but they admit it will not be able to fully assess the damage until the waters have receded. Anadarko, an oil and natural gas exploration and production company, said in a press release on Sept. 17 that they had shut in about 670 of their 5,800 wells and about 20 miles of their more than 3,200 mile-pipeline. PDC energy, meanwhile, said in an online statement that they had suspended production from a "limited number of wells … Beginning last Friday due to wide-spread flooding and extensive road closures in Weld County." Denver-based Xcel Energy said that approximately 50-60 feet of a natural gas pipeline was exposed in Boulder County and that crews were at the site to stabilize and support the line. 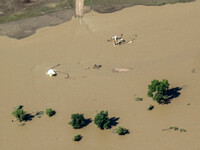 Gabriel Romero, media relations for Xcel, told Al Jazeera that thousands of customers were without power after the company shut in wells and pipelines ahead of the worst of the flooding in affected areas. Romero said that the process of re-introducing natural gas to the lines will be a long one. But critics say all oil and gas wells in the flood plains should have been shut down before disaster struck, or that they never should have been constructed on flood plains in the first place. Prior to the flooding, 158 of the 309 spills were in Weld County alone in 2013, according to Colorado Oil and Gas Conservation Commission records. 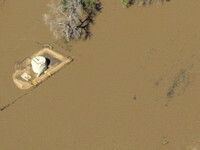 Mark Salley, spokesman for the Colorado Department of Public Health and Environment, was unable to provide new information about the reported leaks or the risk of contamination from the hundreds of wells in the flood plains.